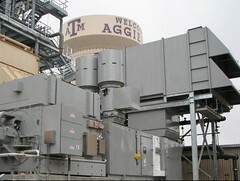 Texas A&M University has been selected to receive a top award from the U.S. Environmental Protection Agency (EPA) for energy efficiencies resulting from the installation on campus of a combined heating and power (CHP) system that requires only 33 to 50 percent of the energy consumed in a typical off-campus power plant, according to Texas A&M officials. Jim Riley, Texas A&M’s executive director of Utilities and Energy Services, was notified by EPA official Gary McNeil that the university is a recipient of the 2013 Energy Star CHP Award that was formally presented at the International District Energy Association Campus Energy Conference in San Diego on Feb. 20. “Through the recovery of otherwise-wasted energy to provide heating, cooling and domestic hot water to campus facilities, Texas A&M has demonstrated exceptional leadership in energy use and management,” said McNeil, who heads the CHP Partnership Program in EPA’s Climate Protection Partnership Division. Citing the significant savings in fuel, he said Texas A&M’s CHP system “prevents an estimated 99,600 tons per year of carbon dioxide emissions, while providing enough electricity to serve more than 11,000 homes. Texas A&M’s 5,200-acre campus serves a 50,000-member student body, one of the largest in the nation, and a highly active faculty, many of whom are engaged in a multitude of research projects while also carrying out their teaching responsibilities. Riley pointed out those experiments and studies, which require highly reliable utilities and energy, represent an annual investment of more than $700 million, placing Texas A&M among the leading research institutions nationally. Read the full TAMU Times article for more information.